Where Are The Adirondack Mountains? The Adirondack Mountains roughly form a circle spanning a large part of the U.S. state of New York. Beautiful Lake George in the Adirondack Mountains in the New York State counties of Warren and Essex. The Adirondack Mountain region, covering an area of approximately 24,300 square kilometers, is located in the northeastern part of New York State in the U.S.A. The mountain belt runs in a southward direction from the Saint Lawrence River Valley to the Mohawk River Valley, and is geographically separated from the Green Mountains of Vermont by Lake Champlain and Lake George. The Adirondack region is riddled with many peaks and foothills, of which 46 have an elevation greater than 4,000 feet. The highest peak in the region is Mount Marcy, with an elevation of 5,344 feet. Algonquin Peak, Haystack, Skylight, Whiteface, Dix, and Giant are some of the other major peaks in this mountain belt. The Adirondack Mountains are predicted to have been formed around 1 billion years ago, and since then have been subjected to extended periods of erosion and glaciation. Prior to the arrival of Europeans, the region was only occasionally visited by natives, like the Algonquin and Mohawk Indians. Though these natives hunted in the mountains, they did not establish permanent settlements there. Samuel de Champlain, the famous French explorer, was probably the first European to encounter the mountains, doing so in 1609. In the later years, European missionaries, explorers, and fur trappers often passed through the mountain region. The first settlements, in the forms of the British-built Fort William Henry and the French-built Fort Carillon, were established in the Adirondacks region during the French and Indian War, lasting from 1754 to 1763. The economic importance of the area came to light with the discovery of rich iron deposits in the mountains towards the end of the 18th Century. Logging activities in the dense forests of the area were also highly instrumental in encouraging settlement in the region. In the late 19th Century, the region became highly popular among tourists and, by 1875, more than two hundred hotels existed in the region. The rapid loss of wild forests in the Adirondacks soon started alarming the conservationists of the time, and in 1885 the Adirondack Forest Preserve was created to protect the forests against logging ad developmental pressures. Today, vast sections of the Adirondacks Mountains region fall under the purview of the Adirondack National Park, the largest national park in the United States outside of Alaska. There are about 102 towns and villages in the area, which are populated by approximately 132,000 people. 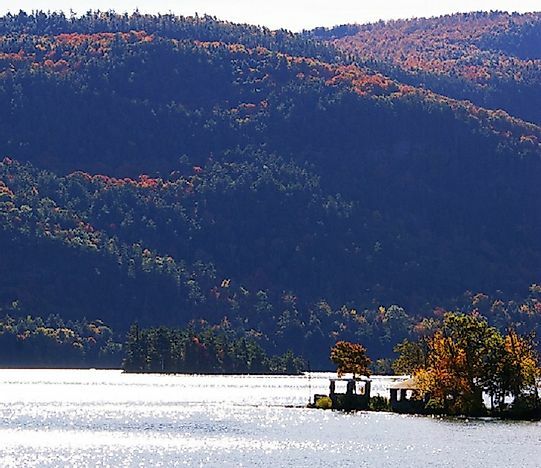 Unlike most other state and Federal preserves, where private ownership of land is strictly prohibited, 52% of the area of the Adirondack Park is owned privately. Lumbering and agriculture is extensively practiced on the private properties. Deposits of garnet and Wollastonite in the region favor the development of mining activities for extracting these minerals. Tourism is also an important income generator in the Adirondacks Mountains region, and a large number of state-supported campsites, resorts, and other tourist facilities exist here. Hiking, canoeing, skiing, and swimming are some of the most popular activities offered to the tourists visiting this mountainous region. The Eastern forest to Boreal forest transition eco-region covers large sections of the landscape of the Adirondack Mountains. Spruce, pine, and various deciduous trees are the most common trees in the region. Swamps, marshes, and bogs are also part of the mountain landscape. An alpine climate prevails only in those regions of the mountain belt where peaks are high enough to inhibit the growth of vegetation. The avian fauna of the Adirondacks Mountains include Common loons, Boreal chickadees, crossbills, and Spruce grouses. The marshes of the region are populated by Painted turtles, Spotted salamanders, bullfrogs, and other wetland species. Around 53 known species of mammals inhabit the Adirondack Park as well, including martens, River otters, Flying squirrels, beavers, Black bears, moose, and American minks. Today, a large number of environmental problems threaten the well-being of the plants and animals dwelling in the Adirondack Mountains. More than 700 bodies of water in the Adirondacks Park have lost large numbers of native fish, amphibian, and other aquatic species. The introduction of non-native species, such as gobis, Zebra mussels, and ale-wives, have been instrumental is eliminating these native species from the Adirondacks’ aquatic ecosystems. Extensive logging activities and the rapid development of the tourism sector in the region also disturbs the ecological balance of the mountain habitats. Efforts are being made to reintroduce and revive the native fauna of the park, including the beavers, ospreys, and lynxes, whose numbers have been decimated over the years due to frequent episodes of indiscriminate hunting.